Stop fumbling around with cheap clamps from your local auto parts store and step up to quality workmanship from P2R. Every racer knows the “little things” can cause big problems if they fail on the track. Made of a solid stainless steel band these clamps are built to last! Stainless Steel - USA Made Ever break a TPS sensor? We all have I am sure. Ever have to put Hondabond or some other kind of sealant on the TPS gasket because it ripped? We have all done that too. Well here is the solution to fix that problem. P2R TPS sensor gaskets are made from high quality Vellumoid material. Ever break a TPS sensor? We all have I am sure. Ever have to put Hondabond or some other kind of sealant on the TPS gasket because it ripped? We have all done that too. Well here is the solution to fix that problem. P2R TPS sensor gaskets are made from high quality Vellumoid material. High quality vellumoid material. High quality vellumoid material. P2R OE Style gaskets are made from high quality Vellumoid material, and are 1/32" thick. P2R OE Style gaskets are made from high quality Vellumoid material, and are 1/32" thick. Stainless Steel Allen Head Bolt Kit for 2012-2015 Honda Civic Si Engine Cover. Includes 4 stainless steel allen bolts and 4 stainless steel washers. 2 bolts go on the top of the cover and the 2 that hold the bracket to the intake manifold. Stainless Steel Allen Head Bolt Kit for 2012-2015 Honda Civic Si Intake Manifold (Plastic Section Only). Includes 5 stainless steel allen bolts, 5 stainless steel washers, and 2 stainless steel nuts. P2R intake resonator delete for 12+ Honda Civic Si. Custom sized red rubber cap and stainless steel worm clamp both made in the USA offer a high quality solution to remove your air intake resonator. The original Honda intake for this vehicle is a well engineered piece. The P2R resonator delete helps you to retain the Honda lower section of the intake so that you can continue to take advantage of Honda's engineering while adding some sound to your intake to make your engine sound more beefy. for your lsvtec/b20vtec hybrid engines. No need to go to the machine shops to drill out your head. These are very easy to install and are a must have for your hybrid motor. OBD2 B Series 60mm. 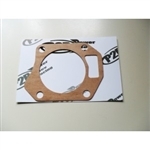 P2R Power Rev Racing throttle body gaskets will help reduce intake air temps by removing the direct connection of the throttle body to the intake manifold. By placing this thermal gasket between the throttle body and the intake manifold, you will help reduce the amount of heat soak the intake manifold normally absorbs. 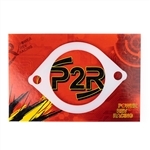 P2R Power Rev Racing throttle body gaskets will help reduce intake air temps by removing the direct connection of the throttle body to the intake manifold. By placing this thermal gasket between the throttle body and the intake manifold, you will help reduce the amount of heat soak the intake manifold normally absorbs. 2017 Civic Type R - Turbo Inlet Thermal Gasket EGR block off plate for almost any Honda engine with EGR. Includes stainless allen head bolts, and gasket. Fits the following applications.